Anyone who knows me knows I love my sous vide. It allows one to cook meat to the perfect degree of doneness, while most of the time spent is unattended. I’ve been making chicken marsala for a long time now. I don’t remember where I found the recipe originally, but I’ve since taken it a long way in my own direction. 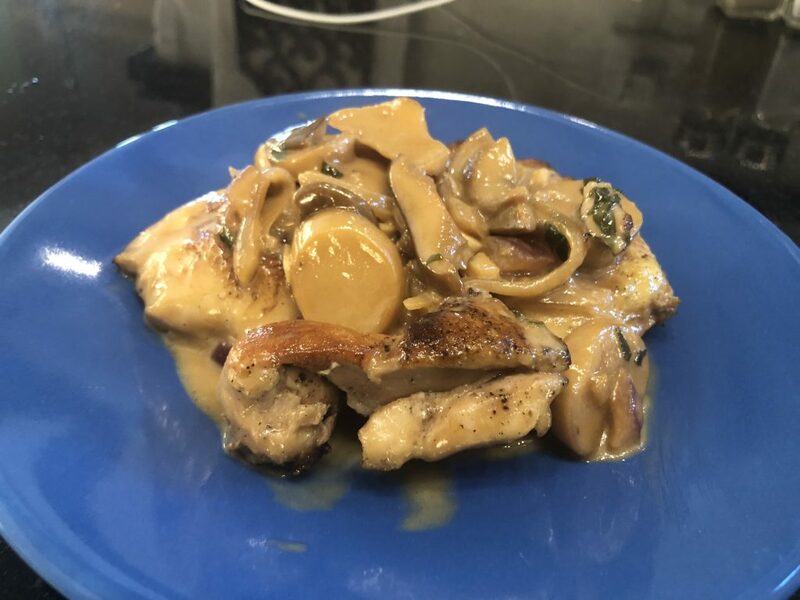 One of the big challenges was developing a recipe that allowed one to build the marsala sauce, while not running the risk of overcooking the chicken. This low-carb friendly recipe is what I’ve come up with. Note 1: Before you ask, you’ll want to know what an umami bomb is. This is a concept that Kenji Lopez-Alt discusses in his brilliant book, The Food Lab. Basically, you mix together small amounts of soy sauce, marmite, and chopped anchovies, and add them to your dish. Individually, the amounts should be small enough that they don’t add their own flavors, but together the increase in umami in the dish is amazing. It just makes the whole thing more “meaty”. Note 2: I use chicken thighs, because I think they just taste better. If you prefer, chicken breasts should work fine. Note 3: Use the best, fresh mushrooms you can get hold of. Bellas will work fine, but I prefer to splurge and get something nice from Whole Foods. It doesn’t add a whole lot of cost, but adds a lot to the flavor. Don’t even thing about using white button mushrooms, which are just about worthless. Note 4: We are usually eating low-carb, so we tend to pair this with something green. It would go well with pasta or rice, however. Season thighs with salt and pepper, and let sit on a rack in refrigerator over night. Seal in sous vide bag (or bags) with shallot and garlic. Place in sous vide at 165 degrees for 1 to 4 hours. Try not to go beyond 4 hours, as the chicken will begin to break down too far. Remove from bag and dry well using paper towels. Save the juices from the bag. Heat vegetable oil in a cast iron pan over medium-high heat. Sear chicken until browned, take out of pan, place on plate and cover. To the same pan, add butter and mushrooms and sauté until mushrooms begin to brown. Stir in onion and garlic and continue cooking 1 minute. Deglaze the pan with the Marsala wine, and then stir in heavy cream, beef base, umami bomb, pepper, and parsley. Let simmer 4 minutes, or until liquid has reduced by about half. If time is permitting, continue reducing sauce, adding bag liquid as needed to keep it from drying out. This really layers the flavor on. Return chicken to the hot sauce before serving. Looking at the picture on this post, I realize that it’s a bit color challenged. To up the plate appeal, chop some flat leaf parsley finely and sprinkle on top after plating.